Punch Magazine? Judy Magazine? Anonymous? My lord, really, some parts of it are very good. My lord, I assure you that parts of it are excellent. A spoiled egg is typically thrown away and not eaten. It is viewed as entirely bad. Nevertheless, the meaning of the term “curate’s egg” has shifted over time. It is used figuratively to refer to something which has a mixture of positive and negative attributes. It is both good and bad. Would you please explore this topic? Quote Investigator: This joke is usually traced to a cartoon published in the humor magazine “Punch” on November 9, 1895, and that cartoon is shown further below; however, the origin can actually be traced to an earlier time. 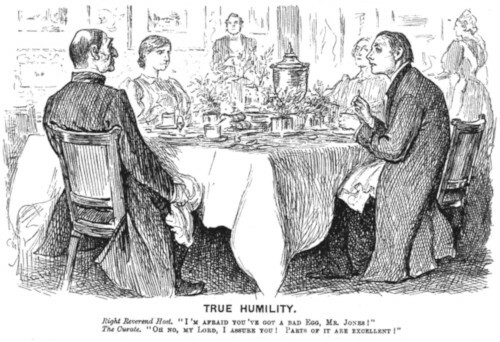 Without pledging our credence, we could afford a grin to the story of the “young Levite” who at a bishop’s breakfast-table, was so ‘umble as to decline the replacement of a bad egg by a good one with a “No thank you, my Lord, it’s good enough for me;” . . .
Bishop (to timid Curate on a visit). DEAR ME, I’M AFRAID YOUR EGG’S NOT GOOD! Timid Curate. OH, YES, MY LORD, REALLY-ER-SOME PARTS OF IT ARE VERY GOOD. 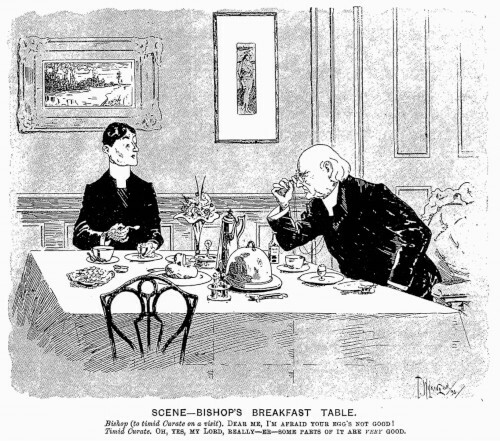 Scene: Bishop’s breakfast table.— Bishop (to timid curate on a visit): Dear me, I’m afraid your egg’s not good. Timid Curate: Oh, yes, my lord, really—er—some parts of it are very good. In June 1895 the gag jumped across the Atlantic and appeared in “The Chicago Tribune” of Illinois, 4 the “St. Louis Post-Dispatch” of Missouri, 5 and “The Los Angeles Times” of California. 6 “Judy” was acknowledged, but the one-panel comic was omitted. BISHOP (to timid curate on a visit): “Dear me, I’m afraid your egg’s not good? 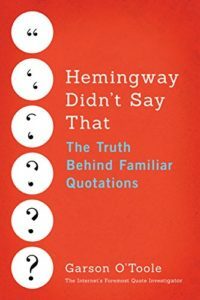 In conclusion, the humor of the “curate’s egg” began with an anonymous anecdote circulating by 1875. The magazine “Judy” deserves credit for publishing a cartoon on May 22, 1895 with a punchline containing the distinctive phrase “some parts of it are very good”. The magazine “Punch” published very similar cartoon joke on November 9, 1895 with the punchline phrase “parts of it are excellent”. QI believes that “Judy” should be given priority credit. 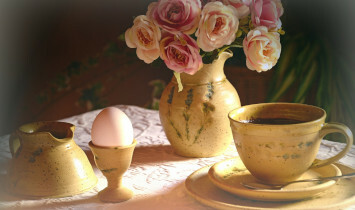 Image Notes: Picture of breakfast table showing an egg in an egg cup from Peggychoucair at Pixabay. Image has been resized and cropped.